Ahead of the arena, a new subway entrance for Atlantic Ave.
Amidst little fanfare on Monday afternoon, the MTA opened up a new subway entrance. This isn’t just any old subway entrance. Rather, it is the subway entrance that leads to the Barclays Center, an arena that sits atop rail yards handed over by the MTA Board to Bruce Ratner for a well-below market rate of $100 million. Over the years, the Atlantic Yards debacle has garnered more than its fair share of debate (and a very thorough website devoted to tracking the project in all its glory), but one element that has seemingly flown under the radar until recently concerns traffic, transportation and pedestrian flow around the arena. Simply put, the arena is in a terrible spot for pedestrian safety. On its north side is a six-lane road that features cars speeding by at all hours of the day, and on the other side is a six-lane road that features cars speeding by at all hours of the day. Meanwhile, parking in the area is nearly non-existent, and the city, Ratner and the MTA has spent a few months telling anyone who will listen to just take the train. The Barclays Center has begun an ad blitz showcasing how subway-accessible the arena is, and the Harlem Globetrotters plugged the LIRR last week. It may take a trip or two from intrepid drivers to discover the reality of the situation, but beyond some loading areas that are slightly recessed from the rest of either Atlantic or Flatbush Avenues, car access to the arena is nearly a non-starter. And so to accomodate the crowds, part of the arena work involved a new subway entrance that eliminated the need to cross these busy thoroughfares. Until Monday, passengers disembarking at the erstwhile Atlantic Ave.-Pacific St. stop had to cross either Atlantic or Flatbush to reach the location of the arena. 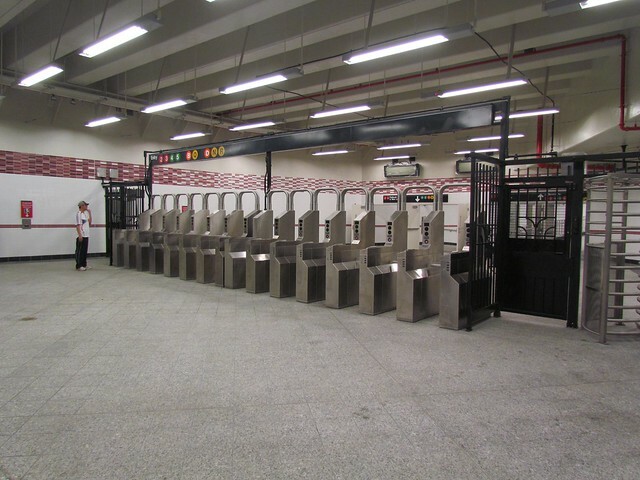 A new subway entrance that leads directly from the IRT and BMT Brighton Line platforms and features wide concourses is ready, willing and able to accomodate the crowds that will fill the 18,000-seat arena. With no public ribbon-cutting or any sort of press release, Transit had what could be called a soft opening of the subway entrance and the surrounding plaza on Monday. I took my camera to the area at around 5:30 p.m. and found it largely empty. The benches behind the eco-friendly entrance were in use, but only a few curious subway riders were making use of the new entrance. That will change as word gets around. So besides some plant life growing on the entrance building, what did I find? The new entrance is, as the green globe attests, open 24/7 and provides easy access to 5th Ave. in Park Slope as well as the Best Buy building as part of the Atlantic Terminal Mall complex. The station entrance itself has clearly been built to handle a large influx of crowds. With two escalators, an elevator and five stair cases to go with an ample number of turnstiles, post-game subway riders will find it easy to get from the arena to their trains. Once inside the station, a wide concourse with two ramps directs riders to the IRT trains. 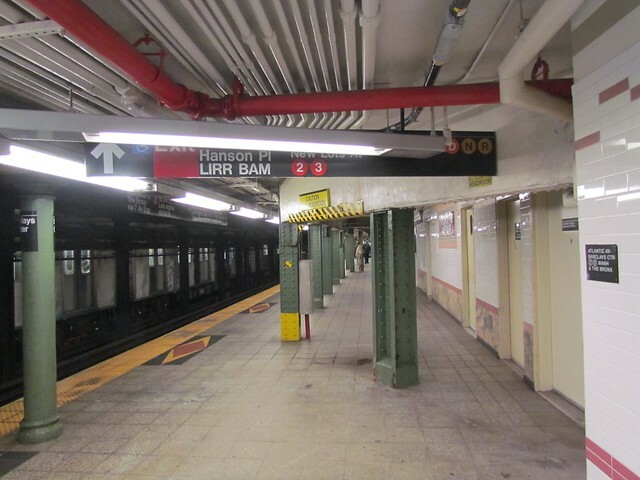 The ramp heading up leads to the Manhattan-bound local (2/3 trains) while an underpass ferries passengers to the express island platform for the 4 and 5 trains or the Brooklyn-bound local tracks. The staircase to the B and Q train platform is right around the corner. In fact, this station could improve the transfer between the IRT and BMT as the walk from the back of the local 2 or 3 platform to the lower level BMT Brighton platform is much shorter. I do worry that with only two small staircases leading down to the rear of the B/Q platform, crowds could build up after events. And so the station is ready for action, and it will be required to deliver. With busy roads and a relatively small sidewalk area surrounding the Barclays Center, getting subway-bound sports fans or concert-goers underground quickly and safely will be a paramount concern for event organizers. To the naked eye and with few riders around, the station looks ready to deliver. We’ll find out in ten days how it handles the crowd. After the jump, a complete slideshow of photos from the new station entrance. The funny thing is, there were a lot of complaints about Atlantic Yards (Including the changing of the name of the subway station), but this is a major benefit (This will help the local population,the Brooklyn Academy of Music Cultural District, and commuters coming into and going from Long Island (A very nice alternative to Penn Station)), that got no publicity. Brooklyn (Along with Lower Manhattan) is already the fastest growing area in the City, and once some of the needed transit improvements (N Train Station Renovation, Culver Viaduct, West 8th St (F & Q)) occur, it will be even better. Not to mention how, as Ben seems to have conveniently forgotten to mention, that its construction is entirely privately funded by Ratner as part of the price to use the land. Forgive me if I’m mistaken, but wasn’t Ratner given the land at a big discount? It’s hardly an example of free marketeering. The costs of building this entrance — which would have been included in any deal — don’t even begin to cover the land giveaway. Though to be fair, the city’s been trying to give the land away for 56 years. Walter Alston just wouldn’t go for it and the domed stadium idea because he saw his fan base moving to New Jersey and Long Island and the (still to this day) lack of parking was the deal-breaker, since he didn’t think they would take the LIRR or the subway to Atlantic and Flatbush avenues. The stadium would have been primarily across Atlantic, where the two malls are now. Atlantic would have been shifted slightly to the south into the railyard. Yeah, privately funded. You keep believing that. Before I comment on the entrance, I haven’t been out the way of the West 8th Street station in years. What’s wrong with it? Didn’t the MTA do some refurbishment at that station when they had it closed for the Stillwell Avenue rebuild? Back on topic though, thanks for the pictures Ben, the new entrance looks really great. For such a big station, it had surprisingly few access points, and only a couple offer direct access from the street (I used to get confused by entering the LIRR terminal to get to the 2 train). This is definitely a good size entrance to handle the crowds after games. It certainly looks like the MTA did a great job with the limited space they had. Platforms at the station (especially the IRT platforms) are already on the small side, which makes overcrowding a serious problem. I was curious if they would add in any more elevators, at least to the IRT platforms, as that seems possible from the layout of the entrance. I guess all that need elevators will need to transfer via the Manhattan bound 2/3 platform. You mean West 8th Street in Coney Island? I was there Saturday and found nothing wrong with it. Unless theres a lot of bird crap pile. Nothing wrong, yet. That large bank of turnstiles and the wide concourse is pretty impressive. It will be interesting to see how this operates following a major event. If only the rehabilitation of the Yankee Stadium Station had been done in a similar manner. Not enough turnstiles on the IND mezzanine, and the elevator smack in the middle is akin to a dam blocking salmon from swimming upstream. Based on the photos, the concourse looks huge! If you know the Yankee Stadium station layout, making your way through isn’t a big deal. Atlantic Avenue on the other hand, does take time to figure since lines are at various locations & it’s not easy to remember where they are since the whole complex is a vertual maze. 1) It isn’t so easy to get to the N/D/R. You have to walk down the Manhattan bound 2/3 platform, which could get crowded. 2) Since the route under Flatbush and Atlantic Avenues is inside fare control, someone who decides to head down 5th Avenue to eat before the game will have to cross Flatbush on foot. One other benefit — you can get to the LIRR without crossing the street. The best way to get to the NDR would be to go to Brooklyn bound 2/3 platform, and walk from there to the NDR, it’s at least one less very big staircase. It would’ve been nice if they built one entrance on the Park Slope side of Flatbush Ave, with a passageway outside fare control to this entrance, especially since the one entrance in Park Slope takes you to the NDR. I imagine it wasn’t feasible to build such a corridor to the Barclays entrance, as it would be near where the IRT becomes double leveled to allow for the BMT Brighton Line on Flatbush. What might be more feasible in the future is just building an entrance on the Slope side of Flatbush that goes to the Brooklyn Bound 2/3 platform. There’s an emergency hatch near the Models, have any of those ever been turned into entrances? Yeah, great suggestion unless Rathner and JayZ or MTA to fork over more money to build. My understanding is that the emergancy exit by Models, along with the underpass now used for the new entrance were orignaly part of an entrance into the IRT station. Before the current work, the size and spacing of the two emergency exits by Models looked perfect for an entrance. I think the issue with putting any entrance there now would be the location and size of fare control. Perhaps when the Models and PC Richards is eventually torn down and replaced with an office/hotel/apartment tower, extra entrances and passageways can be part of the deal. Until then, the entrance at the corner of Pacfic and 4th is still convienent for half the platforms in the complex. One other thing. For me, the best route to the arena is either a) a bike ride or b) the G train. But the G train would require a walk across Atlantic Avenue. I could take the F and the R back the other way, using the new Jay Street transfer. But the walk to the arena from the R platform may be a tight squeeze. So far, so good. To be clear though, since the passage is inside the subway turnstiles, all LIRR passengers are still stuck climbing those ridiculously narrow stairs in Atlantic Terminal and crossing Atlantic Ave, right? That’s the only part that seems like it could be far from ideal when a train full of fans unloads..
Love the Vignelli map for the ad but there’s a “G” bullet on there but the G line is nowhere on the map. I’m not crazy, right? The G train isn’t on the map? You’re right, Barclays Center removed the G depiction to make room for it’s logo. The L and the JMZ are also gone, but since those lines don’t serve the arena, it’s more forgivable and less of an oversight compared to not depicting a line that Barclays Center wants us to use. Maybe you can make the argument that there are no significant landmarks on the G, thus it doesn’t need to be depicted. The whole point of the ad is showing how convenient it is to mostly landmarks in Manhattan. I find it interesting how on all the signs in the new entrance, they arranged and significantly separated the subway lines by which trains stop at different platforms (2,3,4,5; B,Q; and D,N,R) as opposed to the rest of the station, which mostly puts them in numeric and alphabetical order and clumps them all together(2,3,4,5,B,D,N,Q,R) I find the new arrangement more helpful, especially for those who may not know which trains run the BMT Brighton Line or the IRT Eastern Parkway Line. I’m curious to what other options they had with that sign on the IRT platform, given the headroom issues and the inordinate amount of pipes on the ceiling. For my money, partially obscured message is better than no message at all. Not put a light there like that. One way or another one side of that sign would be obscured by a hanging light that isn’t necessary to safely illuminate the platform. I walk across Flatbush and Atlantic all the time, it’s no worse than any avenue in Manhattan. It could be better of course and drivers in Brooklyn aren’t the best and drive fast but it’s really not THAT bad. Still it’s good to see and I hope there are pedestrian improvements later when everyone realizes they are needed. For what it’s worth, the six-lane two-way avenues in Manhattan — Broadway, Park — both have pedestrian islands in the middle which is much, much safer than how Flatbush and Atlantic Avenues were designed. I cross these two roads frequently, but between drivers making illegal turns and the wide crosswalks combined with relatively short crossing times, they’re not generally good areas for pedestrians. I agree with Christopher. I live less than a block from the 4th/Flatbush/Atlantic intersection, and the only times I felt unsafe were before last summer, when northbound 4th Ave traffic would block the interesection at Atlantic. Since northbound 4th Ave was shut off from Flatbush, I have not had any issues. Why these doors? Are they intending to sometimes close this entrance off? I’ve never seen anything like that in the subway — usually an entryway that can be closed during off-hours has some kind of rolling or swinging metal gate. Could be for fire code? Fire Code would be my guess. They are probably set to automatically close when there is a fire alarm to keep smoke from spreading. Not sure how effective it would really be in this situation, but doors like this are common in most new public construcion. It could also be for crowd control. They seem to close off the station from the street, but open into a fairly large room, larger than the doors themselves. It could be that they intend to close these doors on occasion, after events, collecting people in the mezzanine until the platforms clear, when they will let them in. Im not seeing much in terms of ticket machines? And they shouldnt have skimped on the escalators. Might anybody know why they seem to want people to use the IRT to travel between Times SQ or Union SQ and AA (Atlantic Ave)? On the map, they show the travel times via the IRT (based on IRT schedules, since it does take about 22 on the IRT from TSQ to AA and 15 from USQ to AA; the BMT is ~3 minutes quicker, and based on the fact that the times are in red and green for TSQ and USQ) and only marked the IRT USQ stop, but not the BMT Bway line stop. I don’t think they care how people get places. They probably arbitrarily picked the IRT. 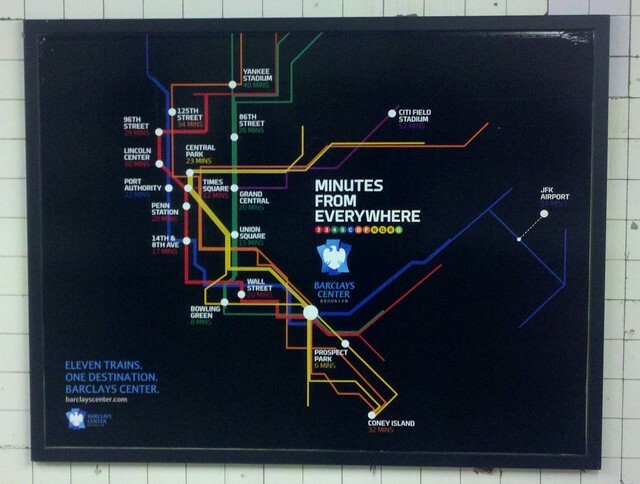 The “11 Trains One Destination: Barclays Center” map missed a couple of elements. It forgot to add the G line, and it also forgot to note the A line to JFK airport, or the rest of the A/C line to Inwood, for that matter. The MTA sign epic fail was awesome, by the way.